When we were first married, husband would constantly have chocolate in the house; M&M’s, Hershey‘s, Nestle Crunch - especially the Snickers bars, those were/are his favorite. I was gaining so much weight that when I had become pregnant with my daughter, it never occurred to me pregnancy was the reason why I was getting bigger. I just thought I was getting fat so, I banned chocolate from the house. I made my husband feel guilty for having it around since I was suffering terrible weight issues. By the end of the week, my husband was having serious withdraws. I found him digging through the cabinets and drawers in the kitchen (he’d already tossed the bedroom and bathroom where he kept handy stashes of chocolate). Much to his relief he discovered a tube of chocolate flavored Cake Mate and was in the process of squirting it into his mouth when I entered the kitchen. The second time I put a chocolate ban in the house, my daughter was about three years old. Being a new mom, I did not want to indulge my child with a lot of sweets. I struggled to teach Amber good eating and snacking habits so I encouraged my husband to refrain from giving chocolate to her. Little did I know, all it took was one bite and she was hooked. Oh boy! And this kid was good too. She could sniff out chocolate in a barn five miles away buried under ten pounds of horse manure (a gift she inherited from her father). My husband, honoring my request not to ply her with candy, would often sneak a bite when she wasn’t looking and then hide the rest of the candy bar from her. After all, Amber was only three. Three or not, she would crawl in her dad’s lap, sniff his mouth, detect the scent of chocolate and the search would begin. Amber did not stop until she found the candy. “I know you hab (have) it, Daddy,” she would chant as she searched his person for the treat. I should have remembered this about her when the second chocolate ban began. I altered the rules a little though and allowed my husband to have his chocolate but to hide it from sight so I would not be so tempted. Less than a week into the ban, my three year old came out of her bedroom to ask me if she could have a chocolate bar. “I’m not ‘pose to tell you,” she admitted sadly. “Then no, you can’t hab it all unless you tell me where you got it from.” It’s so easy to trick a three year old; it should be a crime. “Mere,” she says waving me with the chocolate bar. I follow her to the kitchen and she shows me between the drawers in the refrigerator, shoved way in the back, a six-pack of Hershey’s chocolate bars. “Serves you right to be ousted for trusting a toddler with your secrets!” I did not mention the trickery and deceit I enforced upon her to snitch though. My husband, being a true chocoholic, has always had chocolate and candy strategically placed in different parts of the house. He’ll get up in the middle of the night to go to the bathroom and stop to pop some M&M’s or a Candy Kiss into his mouth on the way. I’ve grown accustom to confectioneries and have learned not to eat them. The kids, having grown up with it in the house, do not indulge in sweets either. 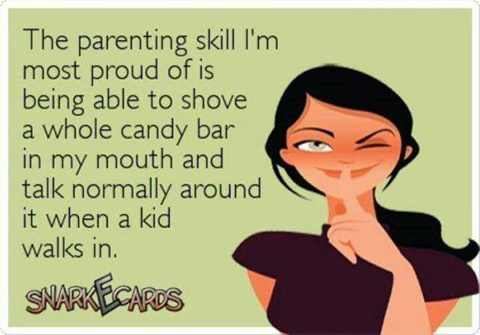 They eat candy in very moderate proportions. They were the only kids on the block who would still have Easter Candy left over at Halloween and Halloween Candy left over at Easter. They’ve never gorged themselves on holiday treats, even though we would let them on the first day. They’ve always known where Dad keeps his stash at too - more often than I did. The mail lady came to the door to deliver a package this past fall. She asked if we happened to have a candy bar on hand, her sugar was getting low (boy did she hit the payload). My son, Reese, told her, “Hold on a minute,” and disappeared. He came back with a Snickers. “Where did you find that?” I asked after the mail lady had left. My husband, recently diagnosed with Diabetes has been candy-bar-restricted. “It was in Dad’s personal stash,” Reese answered.